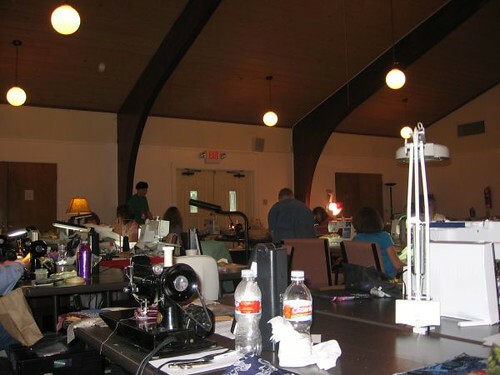 We bring our stuff, we set up our sewing machines, lights, piles of fabric, needles, thread, rotary cutters, mats, seam rippers and other assorted gadgets, and we sew. We also talk a great deal, eat a great deal, and in many cases shop a great deal. Expeditions to the local quilt shops are a major activity. That is my tablemate's prized Singer Featherweight in the foreground (well, next to the water bottles, anyway) - a machine 40 years old or older. They are highly sought after to take to events like this one. The white thing on the right is its polar opposite - a brand-new Swiss-made Bernina. (Apparently both work quite well, but the Bernina costs many times as much, as I understand it.) I brought my small machine - a Janome Jem Gold - but decided that since I intended to quilt I ought to have my Mom's, so I went and got it. Then I realized I hadn't brought a darning foot and couldn't quilt anyway. So I settled for a new project I had dreamed up for my collection of Japanese indigoes I have been amassing for a couple of years. I found an Asian-style panel that could be cut up into 4" squares with a little piece of nature artwork on each. So I cut blue strips, carefully cut apart the squares from the panel, and I was off. I wasn't sure how it was going to work, but so far so good. 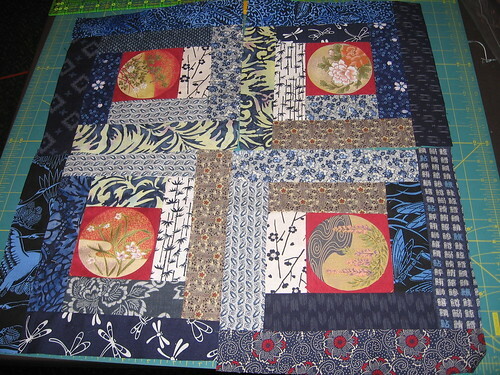 Here are four of the six blocks I finished, and I have more in various states of progress. You can see the little colored drawings in the center blocks, although you will have to turn your head on most of them. I will be able to get them turned correctly in the final quilt, but for purposes of the picture I had to make do. I didn't have any problem picturing what the quilt retreat was like. When I called it a "quilting bee" the other night I was only kidding. I pictured it in a VFW hall or some other more secular place, but apart from that, my idea more or less matched your description. My first thought when I saw the top photo - before reading your comment - was, "Wow, an antique Singer! Bet it still works like a charm too." Which proves something, but I don't know what. I thought for a minute that Bernina only made sergers, but then I realized I was thinking of Babylock. (Their sergers look almost exactly alike.) I just went to the Bernina web site - apparently Bernina is the Singer of Switzerland. I don't know what a darning foot is though. That's the thing about retreats--seems I always forget something. This year it was scissors and the quilt I planned to quilt. I like your backup project. I almost bought a Featherweight once, mostly because it was purple--not authentic but pretty. And Quilt Camp sounds exactly like I imagined, too. I am not a quilter (or a sewer, not by any stretch of the imagination), but if I were, I think I would enjoy the social aspect of it. I've dabbled inexpertly in various crafts, and while I enjoyed them on their own, it was always more fun when I had a partner or two in crime. And it's nice to have someone around for advice and support.